I am a big fan of using Excel templates to plan and manage work. I regularly use to-do lists and calendars to plan my days in advance. 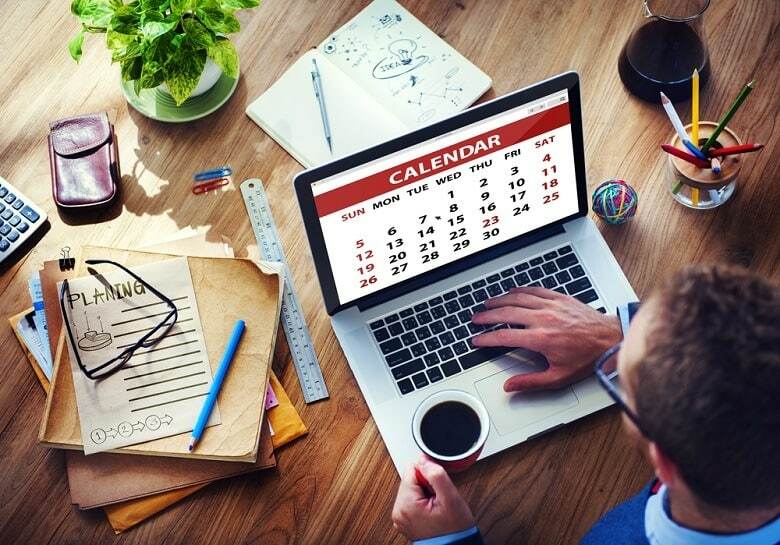 In this post, I am sharing an Excel calendar template that you can use in Excel or even take a print out and stick it at home or at your workplace. While it’s easy to create a static calendar in Excel, I have used the power of Excel formulas to create dynamic calendar template that will update based on the selections you make. It also makes it easy to quickly update the calendar and take a print if needed. Click here to download the Excel Calendar Template. You can specify the year in cell B1 and use the drop-down list in cell B2 to specify the month. Based on it, the calendar automatically updates. You can also specify the holidays in the backend, and it automatically gets highlighted in the calendar (as yellow boxes). You can also print this monthly calendar and write notes, plans, or reminders below it. Alternatively, you can write down the notes in the Excel and then take a print. Similar to the monthly calendar, there is also a yearly calendar (in a separate tab). It’s a dynamic template so you can enter the year number in cell B1 and it will automatically update the calendar for the specified year. You can specify the holidays in the template and those days are automatically highlighted in the calendar. The calendar has been made to fit in a single sheet when you print it. There is also some additional space below the calendar where you can write important notes. Note that you can specify the holidays in the Holidays tab in the template. Make sure that the date is entered in a format that Excel can understand as a date. For example, you can use the dd-mm-yyyy, or dd mm yyyy, or dd/mm/yyyy formats. What goes into making this Excel Calendar Template? Excel Formulas: This template used functions such as DATE, WEEKDAY, DAY, ISNUMBER, COLUMNS, and VLOOKUP. 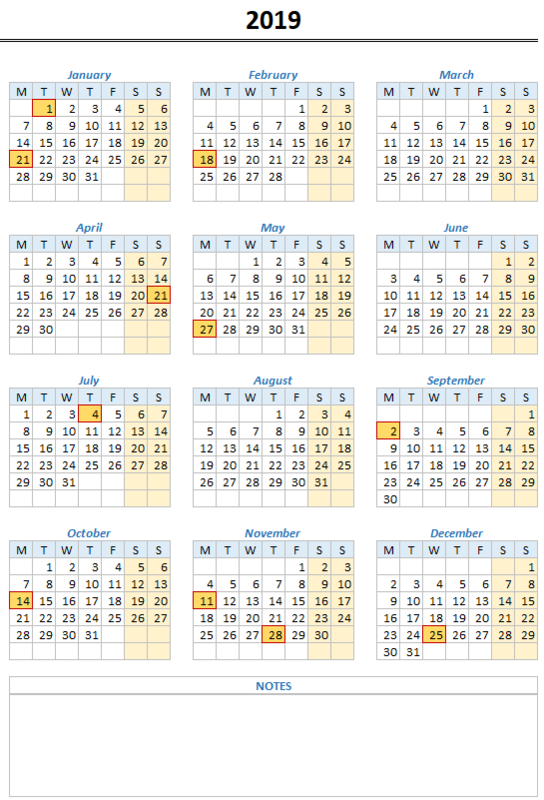 Conditional Formatting: It is used to highlight the holidays in the calendar. Drop-Down List: It is used to give an option to select the month in the monthly calendar. Custom Number Formatting: It is used to show the numbers as months. For example, in yearly calendar, The text January is actually number 1. Select cell B3 in the yearly calendar, and you will see that the formula bar shows 1. This number is shown as the month name using custom number formatting. Employee Leave and Vacation Tracker. Calendar Integrated with To-do List. I’m from the US, and I’ve never seen or used a calendar that starts with Monday. I’m used to a calendar that starts with Sunday and ends with Saturday. Do you have a version of the calendar that is set up that way? Hi, is it possible to highlight seasons (more than 1 day event)? Thanks a lot Sir. Kudos to you. Option for preparing a monthly tour plan will make it more useful. Assalamualaikum, Dear Brother Very Nice & Useful formula. Special thanks for ur effort & knowledge. Query if holidays show in the calender. thats will more better. Why holiday is not show in yearly calender?